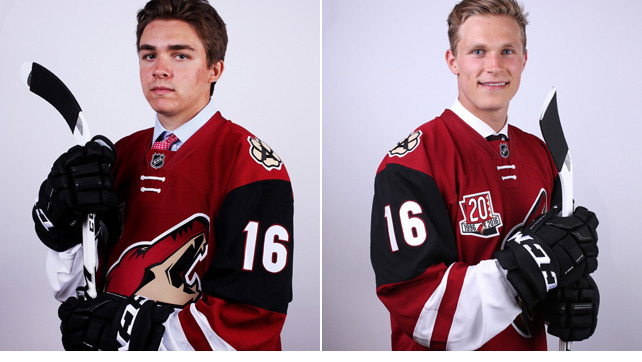 Going into this year’s draft, many regarded the Coyotes prospect pool as the best in hockey. Whenever you have a top-5 player in the CHL in your organization, you’re in good shape – the Arizona Coyotes have two. Led by Dylan Strome and Christian Dvorak, the Coyotes prospect group was incredibly strong last season – and it only got better. With a couple of bold moves from general manager John Chayka, the Coyotes picked up not one but two blue-chip cornerstones in this year’s draft. Clayton Keller and Jakob Chychrun instantly became the team’s best center and defense prospects respectively. The two made a strong group of prospects even more impressive. Let’s take a look at the rest of the Coyotes prospect depth chart as it sits after the 2016 NHL Entry Draft. What stands out when you look at the forward group is the depth at center. With Strome, Keller and Dvorak, you have the makings of an incredibly strong team down the middle. In addition, Macinnis and Dauphin both look like they have the potential to be impact NHLers. With the belief that any successful team needs to be strong down the middle, the Coyotes have set themselves apart in terms of building a group of elite center prospects. On the wing, the right side is significantly more impressive than the left. Fisher, Garland and Merkley all have the skills to play a scoring role in the NHL with the proper development. On the opposite side, I am far less optimistic about Brendan Perlini. After watching him all season in the OHL, Perlini has not grown the way many would have expected and he’s starting to look like a bit of a wasted first round pick. He still has time to grow, but he will need to start developing his game if he ever wants to be an impactful NHLer. The bonus to having a strong center group is that a couple of the high-end prospects can be moved to the wing. Although they’re natural centers, both Keller and Dvorak have played left wing and might end up being moved in order to create balance on the team. During the draft, the Coyotes were able to add three players that instantly became the team’s top-3 defensive prospects. By drafting Chychrun and Dineen and then trading for Anthony DeAngelo, John Chayka was able to make key additions to the future of the blueline. It s believed that DeAngelo is NHL ready and is a lock to fill a hole on the right side this coming season. While Cam Dineen is a certainty to go back to the OHL to continue his development, the same can’t be said for Jakob Chychrun. The Sarnia Sting defender looks to be more NHL ready than any defender from the 2016 draft. He’s already got the NHL build and played a game in Sarnia last season that lends itself to a quick transition to the NHL. The fact that Chychrun was given his traditional #6 at this week’s development camp while all other defenders were given placeholder numbers of 52 and higher could be a sign that the organization plans on having him around this coming season. Guys like Mayo, Mermis and Wood will be key figures on the blueline in Tucson this coming season. Mermis and Wood are guys I’ve watched a ton of in the OHL and both have the steady/simple game that could see them end up as solid bottom pair defenders in the NHL. Adin Hill is the closest thing the Coyotes have to a goaltender of the future – that said, he shouldn’t be looked upon as a blue-chip prospect. He has a long way to go in his development and is far from a sure-fire future NHL starter. There is, however, one interesting name at this year’s Development camp and that’s Vasily Demchenko. The 22 year old Russian is not signed to any contract but he was invited to camp after an impressive season for Chelyabinsk Traktor in the KHL. In 48 games Demchenko had a .922 save percentage in his first season as a KHL starter. The young Russian just signed an extension with his KHL team, but if the Coyotes can buy him out of it and convince him to stay in North America this season, he could be a very interesting prospect for the team.